The Angriest: Star Trek: Voyager: "Initiations"
It is 4 September 1995, and time for another episode of Star Trek: Voyager. Commander Chakotay (Robert Beltran) is undertaking a Native American ritual in a shuttlecraft when he comes under attack by the Kazon. 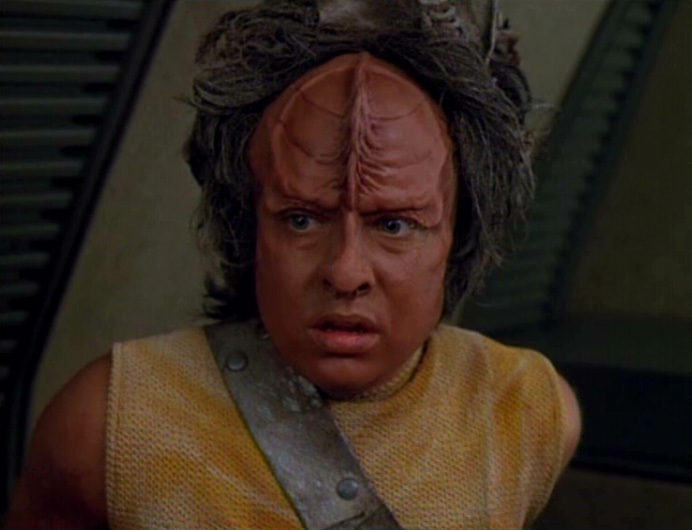 His key assailant is Kar (Aron Eisenberg), a Kazon youth undergoing a ritual initiation to become an adult member of his community. With the Season 1 finale "The 37s" held over to launch Season 2, this actual opening episode got bumped to the second week. It is certainly a much stronger episode, although that doesn't necessarily make it particularly good. "Initiations" is a flawed hour of Star Trek with some decent character work, but a fairly rote and underwhelming story. It is a welcome development to see an episode based so heavily around Chakotay. Throughout the first year he was a terribly under-exposed and under-written character, and actor Robert Beltran's apparent boredom playing the role was fairly obvious. That's a problem that plagues the character through all seven seasons, to be honest: Beltran deserved better material, while the series as a whole deserved a more engaged and enthusiastic actor. Chakotay's Native American heritage always felt tokenistic and superficial when presented on screen. That doesn't change here, but the episode finds a lot more traction in establishing a relationship between him and the young Kazon Kar. It's a strange relationship that shifts from adversaries to a sort of reluctant older/younger brother dynamic as the episode goes on. Their encounter also allows the series to better flesh out the Kazon culture, something that like Chakotay was severely underdeveloped during Season 1. Guest star Aron Eisenberg does an admirable job as Kar, but suffers from the problem of audience recognition. At the time this episode was produced Eisenberg was also playing the semi-regular role of the Ferengi teen Nog in Star Trek: Deep Space Nine. He plays a completely different character here, and he plays it extremely well, but it's impossible not to immediately recognise his voice and face - despite the differing prosthetics. Ultimately "Initiations" is a fairly ordinary episode, but it passes the time serviceably and is essentially a reasonably enjoyable way to pass an hour. It's certainly heads-and-shoulders above "The 37s", and brings the Season 2 quality ratio right up to 50 per cent. Chakotay is a character who seemed to have a purpose in the first season, when he was the peacemaker between the Maquis and Starfleet crews. Once the series pretty much removed that element of conflict, the character lost his reason for existence, and the writers struggled to give him direction. That's not to say that he didn't have some good storylines (and I enjoy this episode with the young Kazon quite a bit), but he does seem directionless. Yeah, can't disagree with any of that.